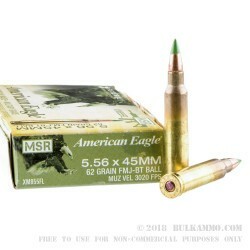 For shooters who value premium performance at an affordable price, this 5.56x45 "Penetrator" ammo by Federal American Eagle is the way to go. Federal's American Eagle brand is known for producing sturdy, well-made cartridges. Each cartridge is crafted using military grade components and assembled according to military specifications. 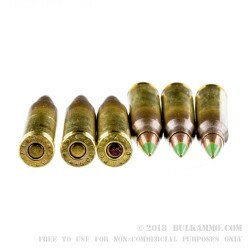 These 5.56 NATO rounds feature 62gr full metal jacket XM855 projectiles. 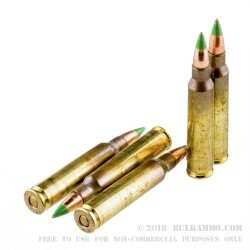 This style of bullet is very popular for long-distance target shooting and hunting because the steel tip stabilizes the bullet in flight resulting in a high rate of accuracy. Deep penetration of the target is another benefit of these high energy rounds. 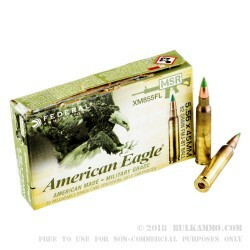 This ammo uses Lake City brass casings that are Boxer-primed, non-corrosive, and reloadable. Federal Premium is a reputable American ammo manufacturer who is creeping up on its 100th birthday. A company doesn't survive nearly a century without a superior product and the support of a loyal customer base. Experience the functionality of Federal 5.56x45 ammo, and order your bulk case of 500-rounds today! Q: Do these rounds come on a stripper clip or just in a box? A: Hello Austin, This ammunition is packaged in standard 20 round boxes and is not loaded on stripper clips. Q: What is the head stamp on the brass? A: Hello Ryan! This Federal 5.56 features a Lake City (LC) headstamp. Q: Is this indoor range safe? no steel? and are these remanufactured? and can they be reloaded? A: Hello Jesse, This ammunition is loaded with an SS109 bullet and contains a steel penetrator in the core. It will not be able to be used at any range that restricts steel in the ammo. The brass can be reloaded.